WOO HOO! What a great promo right?!! Be sure to CLICK HERE and enter the promo code REVIEW to get this great offer!! Here is a little something I made with my Cameo just for this. I really needed some St. Patrick's Day decor so I downloaded the 5 clover Shamrocks by Lori Whitlock Design ID 38917. It was perfect! I cut this out with vinyl and applied it to the glass of a frame and voila! Now for the best part. The Giveaway. 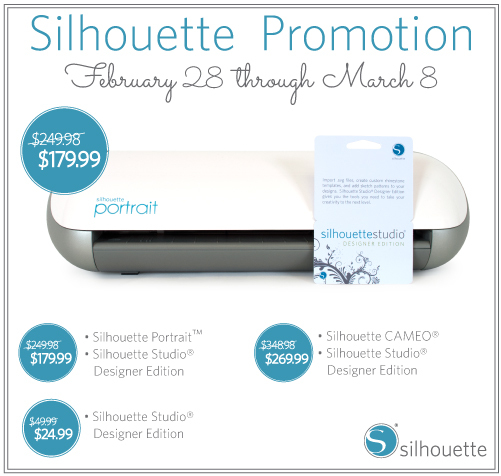 One lucky reader will win a Silhouette Portrait!! WOO HOO!! How great is that! Leave a comment by midnight EST on Monday to be entered to win. GOOD LUCK TO ALL!! WOW! Thank you, would love a chance to win - I have been admiring all the great things that are made with the assistance of the Silhouette - what a great tool! it has been on the wish list .... to be purchased after college expenses go away! Amazing giveaway! How fun this would be to win! A dream come true! WOW! Fabulous giveaway! LOVE your St. Patrick's Day decor too!!! Wow! Great prize! Thanks for the chance to win. What a super giveaway! I would love to have a Silhouette for my scrapbooking! Wow - I would so love to have this! Thanks for the chance to win! Holy smokes! THIS is a giveaway! Thanks so much for the chance to win, I've been wanting one of these! What a super fantastic giveaway! :) Thanks for the chance to win! I own a quite old (5 years old) model of Silhouette and would really LOVE the update it! Thanks for this great giveaway! Terrefic! I love the Silhouette but it is to expensive for me at the moment. Thanks for the great give away! WOW what a great giveaway. I have friends that own Silhouette's and love them, would love to have one of my own to play with! Thanks for the chance to win! Love your project and the awesome giveaway! Thanks! for a chance to win an amazing prize!!!!!!!!!!!!!!!!!!! I'm gonna shout one more time! AWESOME...I have been thinking of adding one to my bday list! My husband wants a Nittany Lion symbol for his wall- a cut vinyl one would be great. Thanks for the chance. That is really cute! Thank you for this great detail! How fun! I hear great things about Silhouette, would love the opportunity to actually use one! I've been thinking of getting one of these. It'd be great to win one! Wow!! What an awesome giveaway!!! Thank you for the chance to win!!! I hope I am lucky, and that I win. Thanks for the opportunity. How adorable! I've seen some really cool stuff made with vinyl and a Silhouette machine! Love your project. Love the framed shamrock! What a cute idea!!! And what a fun giveaway!! You guys ROCK!! What a fabulous prize to win! The Portrait has been on my wish list since it came out. 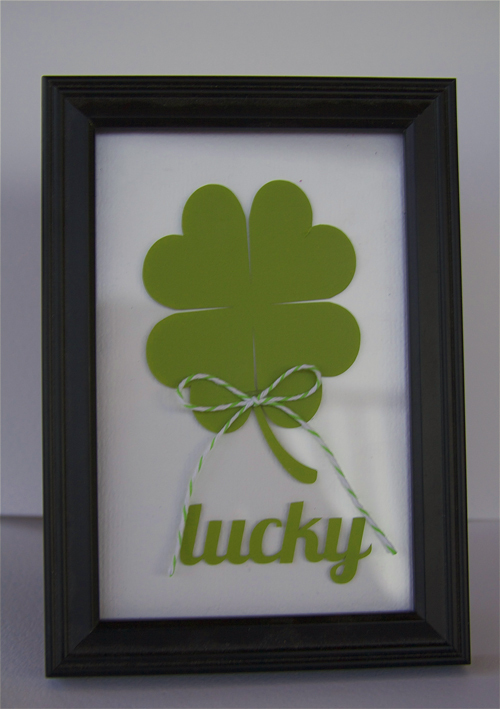 I love your framed lucky clover. It must have been easy to make with Portrait. I love that the clover looks like hearts put together. Thanks for the chance to win this machine. Oh wow -- I would love to win this! Would really like to win this one! No way to duplicate what it can do!! Awesome prize! Would so love to win it. Thanks for the chance. I need, want, and have to win this machine!!! I want to make some crafts with it! I would so love to be the winner of this machine. I have seen so many great designs and titles in layouts I've seen. Oh, please, please. Awesome giveaway! Thanks for a chance to win! Uh, yes please! A Silhouette is always a wanted prize! Thank you so much for the chance to win. Would love it. This is the one thing that has been on my wish list forever! And I love the new, smaller option. Thanks so much for the chance to win. Goodness-gracious. I would LOVE to win! I am dying to throw out my Cricut and give this a try!!! Thank you SO much to Silhouette for the chance to win! How generous! I love Silhouette! Your card is cute! What an incredible giveaway!! I've been eyeing the Silhouette for years! I would love to win the silhouette portrait . What an awesome giveaway, thank you for a chance to win! Wow - that is some giveaway! I could so put it to good use! Very cute project! DS used to trap Leprechauns when he was little so I still do St. Patty's day goodies for him. What a wonderful giveaway. I have been looking at the Silhouette cutters for a while now and would love to have one. Thanks for the chance to win. Oh my goodness, that is one awesome machine, would love to have that in my little scrappy space to play with! Such a great giveaway. I have never tried one of these types of machines. Thanks for the chance to win one. Wow, amazing giveaway! I would love to win a Silhouette. Fun! There are so many things you can do with a Silhouette. What a fun giveaway! I've got my fingers crossed! What a terrific giveaway...I would love to win this one!! My, my, my, what an awesome giveaway! This has been on my wishlist! I would love to win this. Thanks for the chance. I love your shamrock frame - so pretty! Thanks so much for the chance to win one of these awesome machines. Have an awesome day! WowWowWow!! What a great opportunity. I would cry with happiness, if I win! I would love to win thanks! I am fascinated by the Silhouette, but the budget does not allow for another die cutter right now. I see so many cut files for it! Love what you made. Love the way the letters in the word are fused together! Thanks so much for a chance to win! In my opinion-the only electronic digital cutter to have.I would probably faint from excitement if I won-but I'm sure I would quickly recover and start playing. WOW this is a super giveaway I have always wanted one of these. I love everything I have seen made with it. Thanks so much for the chance to win. True story- I've been looking into the Silhouette and that's how I found this blog! What an amazing deal and giveaway to stumble upon. Thanks for the chance!! My wife would LOVE this! Can you imagine if I won it for her? What a fantastic surprise to see that this is the giveaway too! Woo-hoo! Took me awhile to figure out where to leave the comment. I would love a chance to win this. I have so many uses for this for my classroom at school. Thanks for the chance to win. I would love to win a Silhouette Portrait....it has been on my wish list!!! I love all the ideas I keep seeing! Love the shamrock project. Thanks for a chance to win. Such a great portable cutter, and a potentially great prize! Wow, I would love to win this. This is a wonderful electric cutter! I would love to win a Silhouette. Thanks for the chance to win. Awesome prize! I have been wanting to try out a Silhouette. Love your wall decor! Thanks for the chance to win. Wow! I have been wanting one of these forever. It would really help me with Project Life. Maybe this is my lucky chance? Holy cow!! What a great giveaway. I have the first model Silhouette and it is a workhorse. She is definitely ready to be retired though. Thanks for the chance to win! This is a wonderful opportunity to win a Silhouette. I think that would be great. But, just in case I don't win, I tried to order a machine with the promo code REVIEW and it didn't work on the order.I tried it twice so I would like any advice you can give me.